Now that the stems are closed in and the decks installed, I have install some cant ribs. 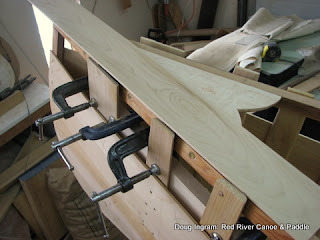 Cant ribs are required to support the planking in the very ends of the canoe where it is not possible to actually bend them. They are not bent over the stem but are half ribs, and are fitted into the space. Boiling hot water coaxes them into shape. 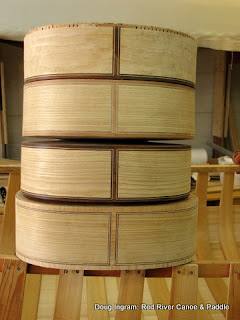 Once the planking is fastened to these cant ribs, then the tops need a little extra fitting. The outer gunnel needs meet the inner gunnel at the very end. If all the ribs are full width, then the outer gunnel has a very hard time being brought close enough to the inner. What to do? Well, the inside face of the last three ribs needs to be shaped so that each rib is tapered. It's one of those things that is harder to explain than to do...once you know how to do it. Here you can see the line for the taper on the very last cant rib. 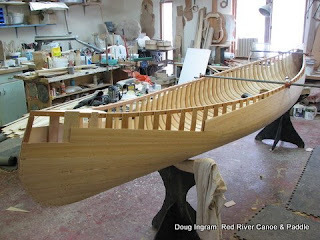 Here is the canoe at the end of Monday afternoon. I'm hoping to have it all closed in and first coat of varnish on Tomorrow. I only have tomorrow left to work on it this week. It's Spring Break for the kids in school, I have to take some time off to spend with them this week. For anyone wondering, "Gee, how is he coming along with those charming little Torres SE117s?" Well, I am just about finished doing the binding. I have the back on just one left to do. 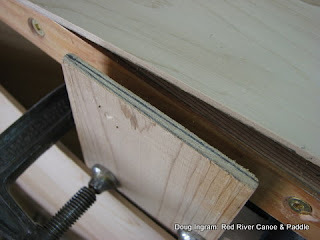 The binding has to be one of the most time consuming and challenging bits of woodworking in building a guitar because of all the prominent joinery. After this, the progress will all be much more obvious. I can only get so much work done on these guitar in one day. After all, this is supposed to be a canoe shop, and I've got this canoe to build! Posted by Doug Ingram at 10:58 p.m.